As an experienced editor and content strategist I've devised, developed, produced, and optimized a variety of digital content experiences from the ground up. Some examples of my recent content strategy and editorial work below. As managing editor at Disney Interactive, I was charged with developing, implementing, and optimizing the DisneyBaby.com content strategy. Working closely with design, technology, and brand stakeholders, I helped create a content-supportive design framework, site templates, taxonomy, and customized CMS solution. From there I crafted a compelling, on-brand experience across an array of editorial touchpoints—from launch day messaging to the site's tagline, blog, promotions, and more. The Brand Story: To tell the brand story on launch day, I created a connected narrative via the DisneyBaby.com homepage iris. The connected iris slides served to introduce the brand, introduce the site, and invite users to explore both further. Site Tagline: I crafted the site tagline to map to the Disney Baby brand attributes and reflect the tone, voice, and value proposition of the site. Site Content: Managing a team of internal and external contributors, I developed a full suite of content offerings for each of the eight DisneyBaby.com content categories—assigning, editing, and overseeing production efforts for all site content. 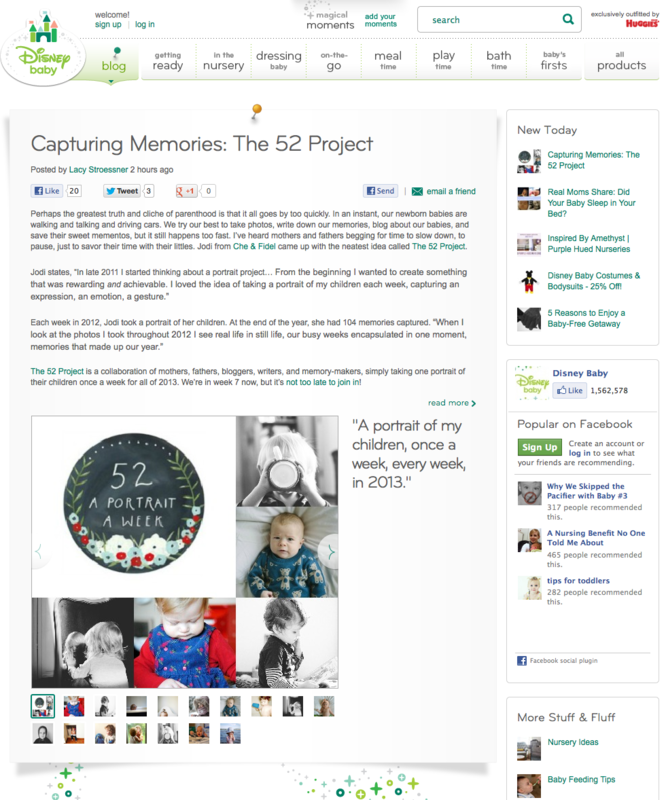 Disney Baby Blog: Shortly after site launch, I helped launch the Disney Baby blog. Working with design, technology and internal partners, I drafted blog requirements, helped develop blog templates, established editorial guidelines, and successfully onboarded 20+ bloggers. Disney Baby Contest: I helped develop the concept and managed all site messaging for the first Disney Baby contest. 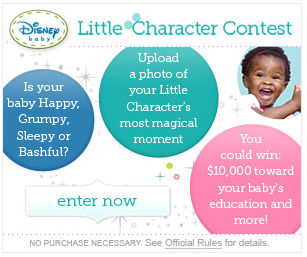 I also came up with the name for the contest, the "Disney Baby Little Character Contest," which reflected both the Disney Baby brand and the theme of the contest. Emails & Newsletters: In addition to drafting copy for onboarding and one-off emails, I also developed the content plan and editorial calendar for the weekly "Disney Baby Magical Moments" newsletter. "Life with Type 1 Diabetes" is a mini site on Family.com sponsored by Eli Lilly. The site offers parents of children with type 1 diabetes resources, timely and topical information, parent-to-parent tips, and expert advice. As the editorial lead on this project, I drove content strategy and development efforts, managing the site content from concept to creation to launch. Site Strategy: The goal was to develop a site that would serve as a family-focused, lifestyle resource for parents of children with type 1 diabetes, and also fit snugly within the larger context and brand identity of Disney Family. com. The range of content on the site, as well as the tone, voice, and strategic approach proved a great fit for both Disney Family.com and Lilly Diabetes. The site has received much praise from parents of children with type 1 diabetes and the type 1 diabetes community at large. Site Positioning: I created the "Everyday Challenges, Everyday Magic" tagline to help position the site and reflect the larger brand association. 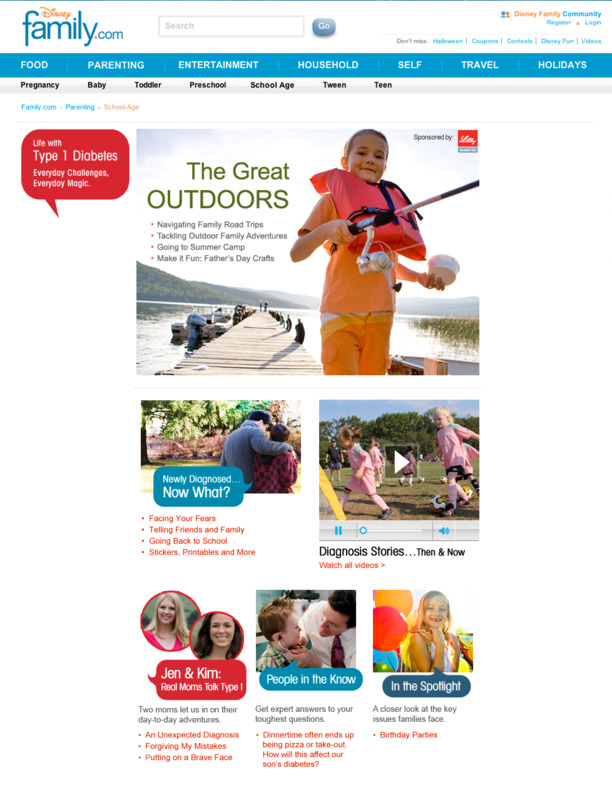 The tagline was used on both the "Life with Type 1 Diabetes" mini site and in promotions. Here it's paired with two contributors to the site, both moms of kids with type 1 diabetes, who were recruited to blog about their experiences and help establish that authentic parent-to-parent connection that is so key to the site. Site Content: A complement to sites that are more medically or clinically-focused, the "Life with Type 1 Diabetes" mini site is meant to provide parents with the tips, insight, and advice needed to navigate the day-to-day joys and challenges of parenting a child with type 1 diabetes. To achieve that, I developed a content plan that would focus on everyday familial concerns—from school and sports issues to seasonal events and parental struggles—and brought in a team of seasoned writers and experts to create helpful resources around each of these topics.